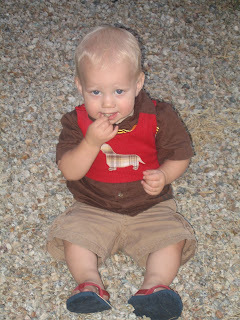 Here a view of what the item looks like when Tiny wears it while eating rocks. Maybe you think my problem is a feeling of disconnection with my past and the item is a vest that will be accompanied by a butterfly collared blouse and a pair of uber-high-waisted polyester double knit trousers thus connecting me with the 1970’s through the dress of my child? If that was your guess you are wrong. Part of the problem with that guess is that the 1970’s are not so much part of my personal past as I was not living upon the earth at that time. 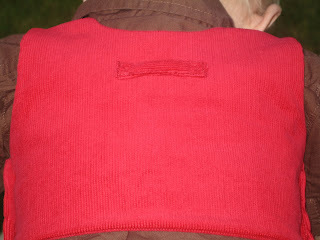 By way of a hint; here’s a close up view of the back. And an even bigger hint; a view of the hardware. That’s right folks, hardware. 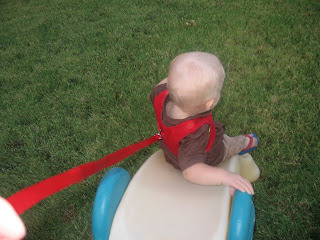 And down the slide he goes, providing a full view of his leash! Dig ding ding! we have a winner! 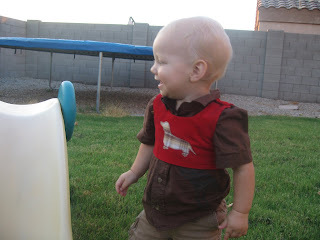 The contraption is a harness providing a means to leash my son. The kid really has been rather unruly these days. At home when he is free to wander he wants nothing more than to be held. When we’re out and I need to hold him he fights to get down. 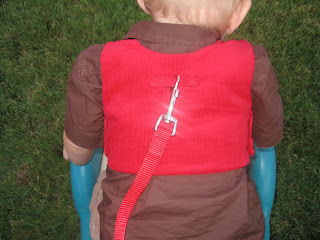 After struggling a few days with this I decided on the harness and leash as a possible solution to half of the problem. If you were wondering, yes, the dog appliqued on the front is an allusion to the fact that I’ve leashed my boy like a pup. I even bought the leash in the pet-care section at my local grocery store. Some may think it shameful to leash a child, but I wonder to myself whether those people have ever navigated an airport with an independent young toddler who is in an especially tantrum prone phase. My guess is, probably not. In all honesty, I have not done that ether, but I will tomorrow and having the leash in my arsenal of coping strategies gives me some small measure of peace in my heart as I face the challenge.